We all know that nowadays Android is one of the leading Mobile OS. We all love to Tweak and play different types of tricks with Android Phones. 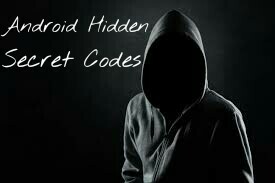 Today I will share some Cool Hidden Android Secret Codes that will help you to know more about Android phones. To enter these codes just pull up the default dialer app and use your chubby fingers to press the correct buttons on your Android Phones. Resetting your phone factory state(Only delete app data and apps). Now that you have the secret codes, don't let them fall into the wrong hands. So use them whenever you wish to check and explore more about your Android smartphone. Also read, "How To Unlock Android Pattern Without Losing Data"